Like free stuff? 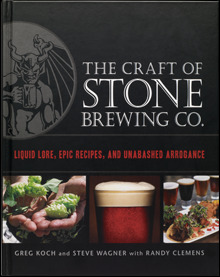 Stone Brewing has graciously given us a copy of The Craft of Stone Brewing Co.: Liquid Lore, Epic Recipes, and Unabashed Arrogance to give away to one lucky reader. The rules are simple. Just comment on this post mentioning your favorite fall seasonal beer for a chance to win! Contest is open to anyone, and will run through October 21, 2012 11:59 PST. We even double checked @mmcooljam's work to make sure the dates were correct this time. GOOD LUCK!